"Sendak" redirects here. For the surname, see Sendak (surname). 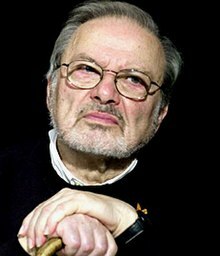 Maurice Bernard Sendak (/ˈsɛndæk/; June 10, 1928 – May 8, 2012) was an American illustrator and writer of children's books. He became widely known for his book Where the Wild Things Are, first published in 1963. Born to Jewish-Polish parents, his childhood was affected by the death of many of his family members during the Holocaust. Sendak also wrote works such as In the Night Kitchen, Outside Over There, and illustrated many works by other authors including the Little Bear books by Else Holmelund Minarik. Sendak was born in Brooklyn, New York, to Polish Jewish immigrant parents named Sadie (née Schindler) and Philip Sendak, a dressmaker. Sendak described his childhood as a "terrible situation" due to the death of members of his extended family during the Holocaust which exposed him at a young age to the concept of mortality. His love of books began when, as a child, he developed health problems and was confined to his bed. He decided to become an illustrator after watching Walt Disney's film Fantasia at the age of twelve. One of his first professional commissions was to create window displays for the toy store FAO Schwarz. His illustrations were first published in 1947 in a textbook titled Atomics for the Millions by Maxwell Leigh Eidinoff. He spent much of the 1950s illustrating children's books written by others before beginning to write his own stories. Maurice was the youngest of three siblings. When he was born, his sister Natalie was nine years older and his brother Jack five. Almost fifty years later, School Library Journal sponsored a survey of readers which identified Where the Wild Things Are as a top picture book. The librarian who conducted it observed that there was little doubt what would be voted number one and highlighted its designation by one reader as a watershed, "ushering in the modern age of picture books". Another called it "perfectly crafted, perfectly illustrated ... simply the epitome of a picture book" and noted that Sendak "rises above the rest in part because he is subversive." Sendak was an early member of the National Board of Advisors of the Children's Television Workshop during the development stages of the Sesame Street television series. He also adapted his book Bumble Ardy into an animated sequence for the series, with Jim Henson as the voice of Bumble Ardy. He wrote and designed three other animated stories for the series: Seven Monsters (which never aired), Up & Down, and Broom Adventures. In 2004 Sendak worked with the Shirim Klezmer Orchestra in Boston on their project Pincus and the Pig: A Klezmer Tale. This Klezmer version of Sergei Prokofiev's famous musical story for children, Peter and the Wolf featured Maurice Sendak as the narrator. He also illustrated the cover art. Sendak mentioned in a September 2008 article in The New York Times that he was gay and had lived with his partner, psychoanalyst Eugene Glynn (February 25, 1926 - May 15, 2007), for 50 years before Glynn's death in May 2007. Revealing that he never told his parents, he said, "All I wanted was to be straight so my parents could be happy. They never, never, never knew." Sendak's relationship with Glynn had been mentioned by other writers before (e.g., Tony Kushner in 2003) and Glynn's 2007 death notice had identified Sendak as his "partner of fifty years". After his partner's death, Sendak donated $1 million to the Jewish Board of Family and Children's Services in memory of Glynn who had treated young people there. The gift will name a clinic for Glynn. Sendak was an atheist. In a 2011 interview, he stated that he did not believe in God and explained that he felt that religion, and belief in God, "must have made life much easier [for some religious friends of his]. It's harder for us non-believers." Maurice Sendak drew inspiration and influences from a vast number of painters, musicians, and authors. Going back to his childhood, one of his earliest memorable influences was actually his father, Philip Sendak. According to Maurice, his father would relate tales from the Torah; however, he would embellish them with racy details. Not realizing that this was inappropriate for children, little Maurice would frequently be sent home after retelling his father's "softcore Bible tales" at school. Growing up, Sendak developed from other influences, starting with Walt Disney's Fantasia and Mickey Mouse. Sendak and Mickey Mouse were born in the same year and Sendak described Mickey as a source of joy and pleasure while growing up. He has been quoted as saying, "My gods are Herman Melville, Emily Dickinson, Mozart. I believe in them with all my heart." Elaborating further, he has explained that reading Emily Dickinson's works helps him to remain calm in an otherwise hectic world: "And I have a little tiny Emily Dickinson so big that I carry in my pocket everywhere. And you just read three poems of Emily. She is so brave. She is so strong. She is such a passionate little woman. I feel better." Likewise, of Mozart, he has said, "When Mozart is playing in my room, I am in conjunction with something I can't explain. ... I don't need to. I know that if there's a purpose for life, it was for me to hear Mozart." A mural alludes to Sendak's passing. Sendak died on May 8, 2012, at age 83, in Danbury, Connecticut, at Danbury Hospital, from complications of a stroke, less than a month before his 84th birthday. His body was cremated. The New York Times obituary called Sendak "the most important children's book artist of the 20th century." Author Neil Gaiman remarked, "He was unique, grumpy, brilliant, wise, magical and made the world better by creating art in it." Author R. L. Stine called Sendak's death "a sad day in children's books and for the world." Comedian Stephen Colbert, who interviewed Sendak in one of his last public appearances on his TV program The Colbert Report, said of the author: "We are all honored to have been briefly invited into his world." Sendak's appearance on a January 2012 episode of The Colbert Report saw him teach Colbert how to illustrate and provide a book blurb for Colbert's own children's book, I Am a Pole (And So Can You! ), and the day that Sendak died was also the book's official release date. The 2012 season of Pacific Northwest Ballet's The Nutcracker, for which Sendak designed the set, was dedicated to his memory. On May 12, 2012, Nick Jr. hosted a two-hour Little Bear marathon in his memory. The writer of the series Else Holmelund Minarik would die herself only two months later on July 12, 2012, at the age of 91. The film Her was dedicated in memory of him and Where the Wild Things Are co-star James Gandolfini. The film was directed by Spike Jonze, who also directed the motion picture adaptation of Where the Wild Things Are. In 1968 Sendak loaned the Rosenbach Museum & Library in Philadelphia, Pennsylvania, the bulk of his work including nearly 10,000 works of art, manuscripts, books and ephemera. From May 6, 2008, through May 3, 2009, the Rosenbach presented There's a Mystery There: Sendak on Sendak. This major retrospective of over 130 pieces pulled from the museum's vast Sendak collection featured original artwork, rare sketches, never-before-seen working materials, and exclusive interview footage. Since the items had been on loan to the Rosenbach for decades, many in the museum world expected that the Sendak material would remain there. But Sendak's will specified that the drawings and most of the loans would remain the property of the Maurice Sendak Foundation. In 2014, representatives of his estate withdrew the works, saying they intended to follow Sendak's directive in his will to create "a museum or similar facility" in Ridgefield, Connecticut, where he lived, and where his foundation is based, "to be used by scholars, students, artists, illustrators and writers, and to be opened to the general public" as the foundation's directors saw fit. The Rosenbach filed an action in 2014 in state probate court in Connecticut, contending that the estate had kept many rare books that Sendak had pledged to the library in his will. In a ruling in Connecticut probate court, a judge awarded the bulk of the disputed book collection to the Sendak estate, not to the museum. In 2018, the Maurice Sendak Foundation chose the University of Connecticut to house and steward the Collection. Under an agreement with, and supported by a grant from, the Foundation, Sendak’s original artwork, sketches, books, and other materials (totaling close to 10,000 items) will be housed at UConn’s Archives and Special Collections in the Thomas J. Dodd Research Center. UConn will also host exhibits of and digitize Sendak materials. The Foundation will retain ownership of the materials. Sendak has two elementary schools named in his honor, one in North Hollywood, California, and PS 118 in Brooklyn, New York. He received an honorary doctorate from Princeton University in 1984. On June 10, 2013, Google featured an interactive doodle where visitors could click on the video go triangle to see an animated movie-ette of Max and Sendak's other main characters. April 15, 2005 – August 14, 2005. Wild Things: The Art of Maurice Sendak at The Jewish Museum in New York. ^ a b Bruni, Frank (May 24, 2007). "Glynn, Eugene David, M.D." The New York Times. ^ "Maurice Sendak Papers". de Grummond Children's Literature Collection. University Libraries. The University of Southern Mississippi (USM Libraries). Retrieved June 12, 2013. With Biographical Note. ^ Inskeep, Steve (September 26, 2006). "Why Maurice Sendak Puts Kid Characters in Danger". Morning Edition. NPR. Retrieved September 23, 2011. ^ Roth, Matthue (October 16, 2009). "Maurice Sendak" Archived May 23, 2010, at the Wayback Machine. Patheos (patheos.com). ^ a b "SLJ's Top 100 Picture Books" Archived November 23, 2016, at the Wayback Machine (poster presentation of reader poll results). A Fuse #8 Production. School Library Journal. 2012. Retrieved June 13, 2013. ^ Hulbert, Ann (November 26, 2003). "How Wild Was the Work of Maurice Sendak? Do his books celebrate wildness—or teach us to master it?". Slate. Retrieved October 13, 2009. ^ Bird, Elizabeth (July 2, 2012). "Top 100 Picture Books #1: Where the Wild Things Are by Maurice Sendak". A Fuse 8 Production. Retrieved June 17, 2013. ^ "Censorship Bibliography — Memories of Childhood: Six Centuries of Children's Literature at the de Grummond Collection Archived October 5, 2013, at the Wayback Machine (June–September 2000). de Grummond Children's Literature Collection. USM Libraries. Retrieved June 12, 2013. ^ Kushner, Tony (December 5, 2003). "How Grim Can It Be?". The Guardian. London. Retrieved October 13, 2009. ^ Bermudez, Caroline (August 12, 2010). "Famed Children's Book Author Gives $1-Million for Social Services". The Chronicle of Philanthropy. XXII (16): 28. ^ a b c Fox, Margalit (May 8, 2012). "Maurice Sendak, Children's Author Who Upended Tradition, Dies at 83". The New York Times. Retrieved February 29, 2016. ^ Barnett, David (June 12, 2012). "Maurice Sendak's British editor: 'I have lost a very, very great friend'". The Guardian. ^ Dunne, Susan (February 22, 2018). "Maurice Sendak Archives to be Housed at UConn". Hartford Courant. Retrieved January 9, 2019. ^ a b "2003: Maurice Sendak: Researches Secret Recesses of Childhood" Archived October 19, 2012, at the Wayback Machine. The Astrid Lindgren Memorial Award. Retrieved August 13, 2012. ^ "Lifetime Honors: National Medal of Arts". National Endowment for the Arts (nea.gov). Archived from the original on July 21, 2011. Retrieved May 10, 2012. ^ "Honorary Degree Recipients – 1990s". University of Connecticut. Retrieved January 9, 2019. ^ "Maurice Sendak to Speak at Goucher College's 113th Commencement". Archived from the original on December 11, 2013. TateShots: Maurice Sendak, a five-minute interview, Tate Museum, December 22, 2011; "look back over his literary career, discuss his love for William Blake and hear why he believes that as an artist, 'you just have to take the dive'"